The fruity and cheerful body care set that contains a body scrub and body lotion with a wonderfully refreshing scent for a truly pampering experience. 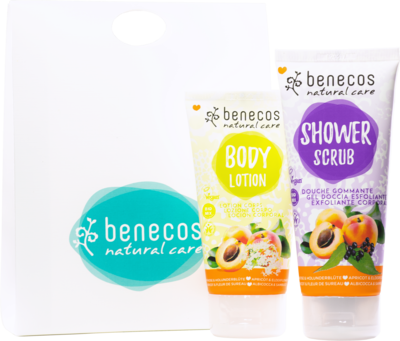 Body Lotion: The fast-absorbing formulation in the benecos Natural Body Lotions is ideal for daily care of all skin types and ensures softer skin. 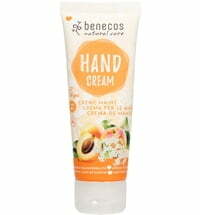 Due to their delicate texture, the body lotions are also suitable as hand creams. The valuable care formula with sunflower oil and lime blossom extract pampers the skin. The body lotions are vegan, BDIH certified and contain the benecos organic blend of seven selected plant extracts from organic farming. With natural Alpine spring water. 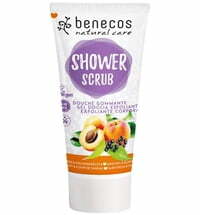 Body Scrub: The natural, gentle benecos Apricot & Elderflower softens the skin thanks to ground and crushed apricot pits and almond shells. Gentle, sulfate-free detergent substances cleanse simultaneously. Enriched with lime blossom hydrolate. The fruity fragrance ensures a good mood. The body scrub is vegan, BDIH certified and contains the benecos organic blend of seven selected plant extracts from organic farming. Without environmentally harmful micro-peeling. Contains natural Alpine spring water. Body Scrub: Apply a walnut-size amount to damp skin and lather, using circular motions and massage. Then remove using plenty of water. 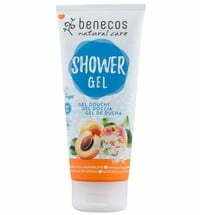 Best used once a week, applying the benecos body lotions thereafter. You'll have smooth skin in no time! 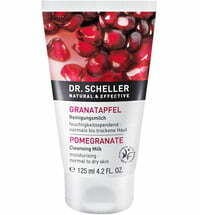 Body Lotion: Apply to the skin and gently massage until absorbed.